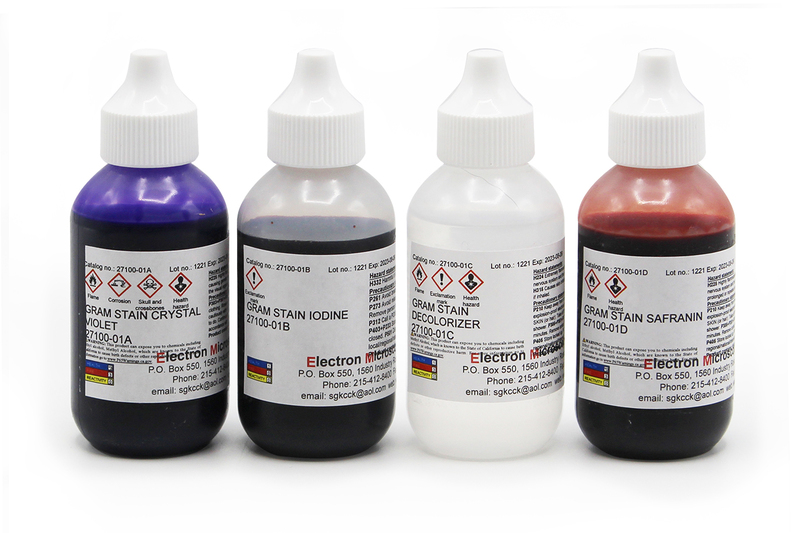 We now offer a complete line of prepared, ready-to-use, high quality staining solutions for all standard staining procedures used by the Biological Staining Commission and the Armed Forces Institute of Pathology. All solutions and concentrations are packaged and prepared in convenient and precise quantities. For a partial list of all of our stains, please see the Stains Chart and for descriptions of the stains, see chemicals section. A stain solution for nuclei. A substitute for Hematoxylin/Eosin. This kit is a Modified Giemsa Stain kit for quick turn around results. The kit may be used for rapid blood smears for differential assessment, as well as for the detection of H. Pylori microorganisms. The kit comes complete with a fixative for air dried cell suspensions and or touch preparation slides. Applications include fine needle aspirations, frozen sections, blood smears, cytological specimens, cytopreps, microorganism detection and bone marrow biopsies. This stain offers results in 15 seconds. The Kit comes complete with 3 solutions and is available in 3 sizes. Tissue processing has not changed in more than a century... until now. The EMS Rapid Pro Processing System can cut total processing time to as little as 46 minutes. Immunosaver allows for Immunostaining with quick and easy activation cell membranes and the nucleus. Immunosaver provides efficient antigen retrieval for successful immunostaining of a wide variety of antigens under optimized conditions. Protocols for both Light and Electron Microscopy may be found with this reagent. A stain solution is for demonstrate RNA and DNA. This kit is a Modified Giemsa Stain kit for quick turn around results. The kit may be used for rapid blood smears for differential assessment, as well as for the detection of H. Pylori microorganisms. The kit comes compete with a fixative for air dried cell suspensions and or touch preparation slides. Applications include fine needle aspirations, frozen sections, blood smears, cytological specimens, cytopreps, microorganism detection and bone marrow biopsies. This stain offers results in 15 seconds. The Kit comes complete with 3 solutions and is available in 3 sizes. 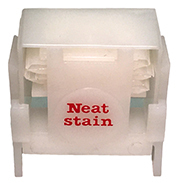 Neat Stain™ Kits are specifically designed for stat procedures and/or laboratories using manual staining methods. Neat Stain™ is available as a rapid three-step differential hematology stain, Gram stain and Trichrome stain staining kit. They are quite simple to use, just immerse your slides sequentially in each reagent for the correct time, air dry and read. Convenient – Additional foils for re-sealing containers. 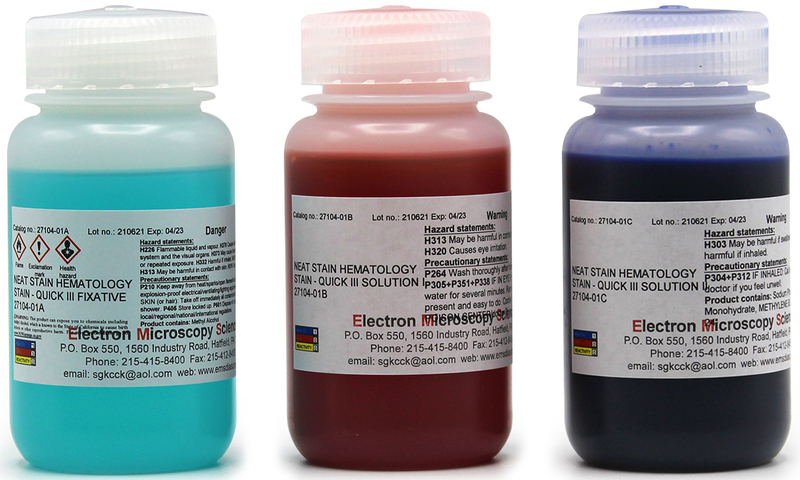 Neat-Stain™ kits are prepared for STAT procedures and /or laboratory using manual staining methods. This 4-step stain kit is prepared for staining bacteria from cultures or specimens by the differential Gram stain method. This kit stains similar to the traditional Wright's and Wright-Giemsa stains. Neat Stain® offers the flexibility of the three dip staining sequence in both the stain and counter stain solution. Kit Contains: 6 Reagent Packs, one Plastic Stand, 6 Re-seal Foils. Kit performs 150 tests. This 3-step stain procedure is designed for differentiation of morphological cell types in peripheral blood smears. This kit is also useful in andrology labs staining microorganism and spermatozoa. Staining characteristics are similar to the Wrights and Wright-Giemsa stains. Neat Stain offers the flexibility of a three dip staining format in both the stain and counter stain solution. This seven-step stain procedure is designed for the staining of stool specimens. Based upon the Wheatley Trichrome technique is a rapid staining procedure providing good results for routine examination. Simplified method, use of mordant prior to staining is not necessary. Staining characteristics are similar to the traditional Wright's and Wright-Giemsa stains. Kit Contains: 3 Reagent Packs, One Plastic Stand, 6 Re-seal Foils. Kit performs 75 tests. Slide Holder sold separately, Cat. #71411-01. Molded from polypropylene. Adjustable to hold 2 to 5 3x1" slides, or 10 slides back-to-back firmly. This Slide Holder works well with all Neat Stain Kits above.